To edit your Favourites or customise your e-mail preferences, go to My Ticketmaster. Customise your e-mail preferences and more on My Ticketmaster. You're in the loop for Aladdin - The Musical! We'll email you before tickets go on sale in your area. Have more than just one favourite artist? Let My Ticketmaster keep track of all of them for you. Has your taste changed? Use My Ticketmaster to find some new favourites! 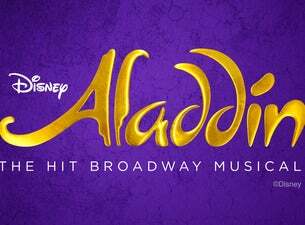 Get email alerts and never miss an onsale for Aladdin - The Musical! Error: please enter your e-mail address. Error: that is not a valid e-mail address format. Please try again. Error: please enter your postcode. Error: this postal code entered is invalid. Please try again. Error: you are currently registered for a different area. To change your area, please visit My Account and update your Profile. There are no matching events in Australia. Disney recommends performances of ALADDIN are suitable for children ages six and up. This production contains theatrical smoke, fog effects, pyrotechnics, strobe lighting and loud noises. Which Aladdin - The Musical event are you going to? Find out who loves live entertainment as much as you! Ask your Facebook friends to connect to Ticketmaster Australia.